Poised on Mt. 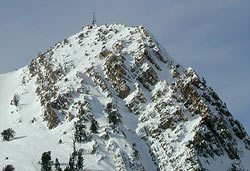 Ogden overlooking the Snow Basin venue, a Campbell Scientific weather station shares space with a communications tower. Snow Basin will host a variety of alpine skiing events. When Salt Lake City opens its doors to the world for the 2002 Winter Olympic and Paralympic Games this winter, adverse weather will be more than a casual concern. Not only could weather delay sporting events, it could also leave surface streets and highways encrusted in snow and ice, impeding venue access for athletes, Olympic officials, international media, and spectators. The effects of snowstorms and other large-scale weather systems are widespread throughout northern Utah. Hazardous winter weather including lake-effect snowstorms, ice fog, gap winds, downslope windstorms and low visibility over mountain passes are often related to local terrain features, the Wasatch Mountains, and Great Salt Lake being the most prominent. As such, planning for a weather support system began in 1995, shortly after the International Olympic Committee designated Salt Lake City as host for the 2002 Games. Managed by the Salt Lake Organizing Committee (SLOC), the system, which includes Campbell Scientific automated weather stations, relies upon meteorologists from the public, private, and academic sectors of the atmospheric science community. It spans the network of indoor Olympic venues along the Wasatch Front (the metropolitan corridor west of the Wasatch Mountains that is home to the bulk of Utah's population and runs 110 km at ~1,300 m in elevation) and outdoor venues on the eastern flanks of the Wasatch Mountains which range in elevation from 2,826 m (9,270 ft) at the top of the men's downhill course, to 1,670 m (5,480 ft) at the cross country/biathlon course. The variations in weather and climate from venue to venue are tremendous. Forecasting responsibilities are likewise varied. Olympic weather support has traditionally been led by the host country's primary weather agency. But weather forecasting duties for the 2002 Winter Games will be shared by forecasters from the National Weather Service and KSL, Salt Lake City's National Broadcasting Company (NBC) affiliate. Individuals from other agencies, including the NWS Salt Lake Weather Forecast Office, the NOAA Cooperative Institute for Regional Prediction (CIRP), the NWS Western Region Scientific Services Division, the Aviation Security Operations Center (ASOC) at Hill Air Force Base, and the Utah Avalanche Center will provide data, resources and forecasts for specific Olympic-related applications. The SLOC weather support group also includes weather volunteers, including undergraduate and graduate students from the University of Utah and other local residents. Close coordination of all groups involved, therefore, will be vital if consistent forecasts are to be ensured. The KSL team consists of 13 private-sector meteorologists charged with providing detailed microscale weather forecasts for the five outdoor venues. Assembled by Mark Eubank, KSL chief meteorologist, the venue forecast team has extensive experience forecasting northern Utah weather. Venue forecasters will have on-site access to the latest weather observations, graphics, and model data. Weather forecasts will be issued three times daily with updates issued as needed. Forecast fields include: sky cover, precipitation type and amount, air temperature, wind direction, wind speed, wind gusts, wind chill, visibility, humidity, and snow temperature. A joint weather phone conference will be conducted each morning between forecasters at the venues, the NWS Salt Lake field office, and the ASOC. Official manual weather observations will be started one hour before each outdoor event begins and will continue at 15-minute intervals throughout the event. Since documentation of weather conditions prior to the Olympics was required for planning (and during the Games for operations), weather equipment was installed at venues and other key locations in northern Utah beginning in 1996. Portable weather stations manufactured by Campbell Scientific, Inc., that were deployed by the NWS Southern Region for the 1996 Atlanta Summer Olympic Games, were made available to the NWS Western Region after the summer games were completed. Also during 1996, the NWS Western Region and the National Severe Storms Laboratory began a research project in the vicinity of Salt Lake City to validate WSR-88D radar algorithms in regions of complex terrain. In support of that project, weather equipment was deployed at eight locations (four within the Wasatch Front and four at Olympic venues). Forecasting and weather-data recording in preparation for the 2002 Olympic Winter Games have allowed a unique partnership to evolve since 1996, with government, commercial, and research communities sharing weather information in northern Utah and throughout the western United States. Initially referred to as the Utah Mesonet, the collection of data outside of Utah led to its redesignation as MesoWest in January 2000. Now, during February and March 2002, weather observations will be available from over 278 locations in the northern Utah region. This article was derived from a manuscript submitted to the Bulletin of the American Meteorological Society.